Robert Burleigh has written a number of bestselling children’s books that have received multiple starred reviews and awards, including the Orbis Pictus and the Texas Bluebonnet Master List. He lives outside Chicago. Sterling Hundley is a professor at Virginia Commonwealth University. His work has been regarded among the mostly highly acclaimed in the illustration world. He was named Illustrator of the Year by the Victoria and Albert Museum, London. He lives in Richmond, Virginia. "Engaging and picturesque . . . 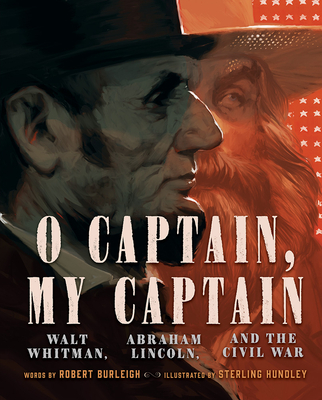 This book is a substantive contribution to the recognition of Walt Whitman and his place in American literary history for young readers." "Hundley's illustrations mirror the tone of the book impeccably, with the harsh blacks, dusty sepia, and brownish reds capturing the weight and cruelty of war . . . The added use of Whitman's poetry throughout the text lends eloquence." "An emotionally and historically resonant homage to two kindred spirits." "Utilizing a succinct, yet lyrical style, Burleigh quotes frequently from Whitman's poetry, providing a good sense of this nineteenth-century icon. Hundley's mixed-media artwork favors black, white, and sepia (consistent with period photos), embellished with color washes . . . Carefully researched and beautifully rendered."